Art of Music will release a limited LP in octagon shape on March 3, 2014. Are we sure Col. Parker is dead? The makers probably think that the odd shape of this disc is the selling point, for me, it is the turn-off. 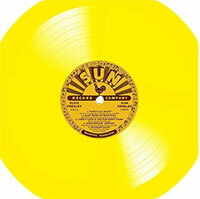 An LP containing the original ten Sun side on yellow vinyl is not in itself a bad idea, the yellow does mean something, but the odd shape puts me off. As for how many times will these recordings be re-hashed, the answer is simple. While people are buying them, they will. If people stop buying them, they won't. how many times over will someone pull the quick buck trigger in 2014? damn ! I was hoping for a triangle shape !